Working with great clients is another part of Harwell Design we enjoy. Sabrina was a rockstar client of ours that we were excited to work for, which is why we are ultra excited to show off her project. For a front yard fence we knew there would be some height limitations so we got together and came up with a solution. In Los Angeles, fences in the front yard can't be higher than 42 inches, but we can build taller as long as we build giving 50% visibility. We were going to install horizontal slats that gave a 50% gap, however Sabrina wanted to do something different and we loved that idea. Staggering the boards on top was the new design and one we are proud to show off! This is what happens when we listen to what the client wants. Combined with what we must do for a sturdy, and lasting structure...something truly and beautifully unique is the final result! 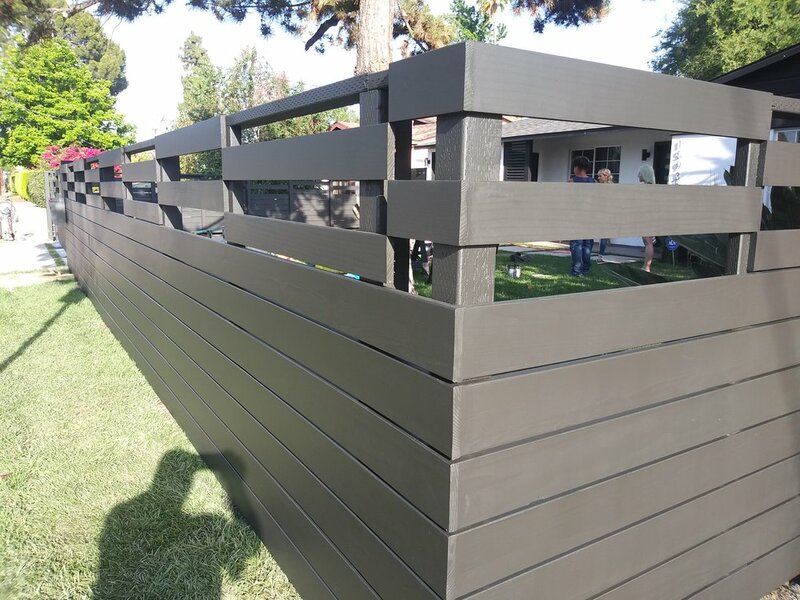 Thank you again Sabrina for trusting us with your fencing and gate project! This sort of expanded checkerboard pattern abides by the city's code that requires 50% visibility while having an "outside the box" design.